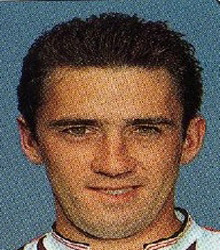 Willie Callaghan (Forward, 1989, 1992-95) – A member of a family which has a 4 generation playing link with Cowdenbeath FC. Son of the ex-Scotland internationalist. Like his father he played for both West Fife clubs. Prior to going senior, Willie represented Hill of Beath Swifts and Dunfermline Railway Club. He then had two spells with Dunfermline (including two loan outs to Cowden) sandwiched between a junior stint with Halbeath Juniors. Back in the juniors again with the highly successful Kelty Hearts side Jim Leishman signed him again for both Inverness Thistle and then Montrose. In 1992/93, at last, Cowden captured Willie on a permanent basis. A fast, hard-working striker, Willie was top scorer in his first 2 full seasons with Cowden. He was Cowden’s player of the year in 1994. Jim Leishman then took him to the new club at Livingston. Willie scored 28 League goals for Cowden. Many were highly memorable including both goals at East End Park in a miraculous 2-0 Cowden victory after 33 league games without a win.